Obadiah’s chaplaincy for the Church of God and service to the military has warranted numerous awards and decorations—such as the Meritorious Service Medal, Air Force Commendation Medal, Air Force Outstanding Unit Award 2 devices, National Defense Service Medal, Air Force Longevity Service, Air Force Reserve Medal 1 device, Air Force Training Ribbon, 09 Grissom Officer of the Year, and the 2010 #1 Outstanding USAFR Chaplain of the Year. 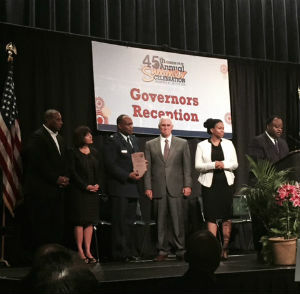 This time, the 2015 Indiana Black Expo Governor’s Award for Civic Leadership/Military was given to Obadiah for the work he has done throughout the community and for Indiana. 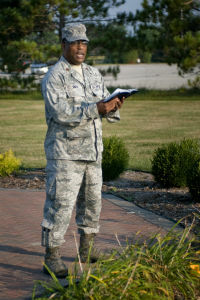 Lt. Col. Obadiah Smith Jr is the Air Force Wing Chaplain attached to Grissom Air Reserve Base in Kokomo, Indiana. He received a BA in sociology from Azusa Pacific University, a masters of divinity degree from Fuller Theological Seminary, and an MBA from Anderson University. He is extensively involved with Church of God Ministries and the Air Force. As an ordained minister with the Church of God, Obadiah has held several administrative positions at the Church of God offices such as project coordinator of Compassionate Ministries; fund development officer, and US ministries coordinator; he has been previously employed as associate director for strategic partnerships with World Vision. His international experience includes travel, program development, teaching, ministry and consultancies in the US, Africa, Europe, Brazil, Romania, Sri Lanka, Haiti, Turkey, and Hong Kong. In terms of future plans, Obadiah is currently trying to enhance his ministry by pursuing his doctorate in ministry in biblical reconciliation from Anderson University’s School of Theology. He also entered a two-year correspondence course at Air War College in an effort to promote to Colonel someday. “The coming years will be very intense, but promising as I continue to continue to seek God’s purpose in my life.” Obadiah concludes. Linette Tang is a communication intern for Church of God Ministries from Anderson, Indiana; and Singapore. She is currently studying math, computer science, and writing at Anderson University. Learn more about Church of God Chaplain Ministries at www.JesusIsTheSubject.org/chaplain-ministries. This entry was posted in All Church of God, Great Lakes and tagged Award, Chaplain, Indiana, military, Obadiah Smith. Bookmark the permalink.